When it comes to proper oral health, there is a lot of information available for the average person to study. Multiple studies, reports, and opinion pieces pop up when you Google any terms relating to proper oral hygiene regimens and, in all honesty, it can be quite overwhelming for a person to try and determine which information is relevant and which information is not. Here at Balboa Victory Dental, we are an Encino dentist office whose main mission is to make sure that as many people in our area are as well taken care of as possible. We want to make sure that people are not only given the best in dental care when they visit our clinic but that they understand the habits that they need to develop in order to make sure that their teeth and gums are healthy in the time between dental visits. In today’s post, we are going to cover a topic that many of our patients are curious about; should you floss before or after you brush? Keep reading below to learn more. When you get down to it, there really isn’t a specific time that you should floss. Whether you choose to floss before or after you brush is mostly irrelevant. What truly matters is that you floss in the first place. While brushing your teeth is the first step that needs to be taken in order to ensure that plaque and bacteria are removed from the teeth, brushing alone cannot remove all of the plaque that needs to be removed. Flossing daily helps to remove the debris from between the teeth that brushing simply cannot reach. If you are the type of person that struggles to use dental floss or are worried that excessive bleeding from flossing is not normal, the only real solution is to keep at it. 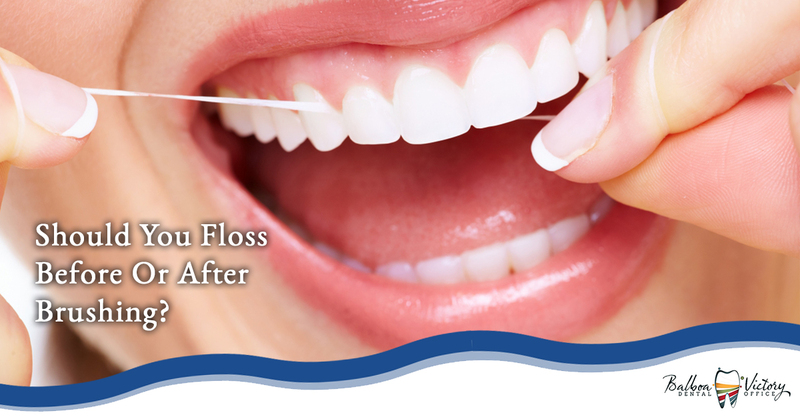 The more you floss, the more your gums get used to the additional cleaning and irritation that flossing causes. Additionally, there are many alternatives to traditional dental floss, such as special brushes, picks, or sticks that may be easier to use. How Do You Know If You Are Flossing Correctly? Another issue that people seem to run into is knowing whether or not they are flossing correctly. How long are you supposed to floss? Are you flossing correctly if nothing comes unstuck from in between your teeth? Is not bleeding a good thing or does it mean you aren’t getting deep enough? While almost any amount of flossing is a good amount of flossing, there are resources available that let people know if they are flossing correctly. Plaque disclosing tablets are available at most pharmacies as an over-the-counter drug and help to reveal any plaque that may have been missed by flossing and brushing. Thank you for taking the time to read our short post on when you should floss. We hope that this post has shown that it doesn’t matter so much when you floss as it does to actually take the time and floss on a regular basis. If you are worried that flossing isn’t quite tackling the plaque in your mouth, please contact us today at Balboa Victory Dental and schedule an appointment at our Encino dentist office. We will make sure that your mouth is as healthy as possible, ensuring that your teeth are good to go.